Review by Manduca on 3/16/2012. This map is amazing. One of the best. It iss just dificult to find players who knows this map. Review by figgyo78 on 3/28/2012. 13 out of 18 people found this review helpful. Review by Lawten on 4/16/2012. A bit complicated, but very interesting to play. It's one map where the center actually has some advantages as opposed to working in from a corner on many maps. Rewards more strategic actions, but takes a while to learn the first go around. Review by Irish Free State on 3/17/2012. 13 out of 21 people found this review helpful. Review by  Sabian49 on 4/15/2012. 10 out of 15 people found this review helpful. Review by random_anon on 5/5/2012. Realistic perhaps, but too unbalanced for a game. Review by MangaMinx on 3/18/2012. Review by General Rope on 3/19/2012. Review by antiloopje on 3/22/2012. Review by Fruit_Fly on 3/31/2012. Great!!! The detail to real statistics and demography really gives you the feeling that you are fighting in a modern Europe. The addition of religions, industrial areas, and monopolies adds to that feeling as well! Review by SuperTechmarine on 12/2/2012. Very good map, though a bit unbalanced, Germany is OP with 17 armies, if someone gets it first, his win is assured. Review by DanWL on 9/2/2013. Review by Super Nice Guy on 6/11/2012. Review by Vladimir on 4/21/2012. Review by mantis religiosa on 4/14/2012. Review by wigibob on 3/20/2012. Review by nate2497 on 4/2/2012. Review by Lord'sResistanceArmy on 4/11/2013. Review by Weisblut on 9/6/2013. Review by Akhoya on 11/26/2012. I respect the effort that went into this map, but it's confusing complex. Review by JAF on 6/6/2012. 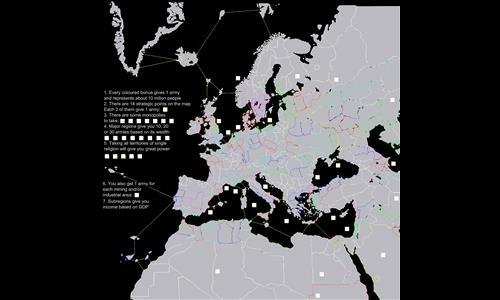 Nice realistic map, but too much complicated to enjoy in game and ... there is bonus for mining zone (uranium,coal,iron,oil), seaports and... fishing zone???? Review by rkkell on 9/17/2012. Excellent strategic map. Would be fun to reenact WW2 on this one. There are enough bonuses to make any starting position tenable, but Western Europe is overwhelmingly more powerful than the rest of teh map. Of course, that is realistic, but something to consider before choosing this map. If there aren't enough players starting in the right places, whoever gets one of the big four first will win. Review by daveyGater on 2/4/2014. Review by wtfrara on 1/23/2013. Fantastic concept and definitely improves the flow of the game. Every territory has some sort of strategical significance so it really puts a lot more planning into each move. The only complaint is that some of the mega bonuses are only possible to get at the end of the game when you no longer need any momentum. Review by warhawk on 12/24/2017. Starting position is ALL that matters on this map.- 4 player FFA-won in 10 turns ! Review by Keim on 3/23/2012. Regions are very big for the territories they give. It is also very difficult to see anything without zooming in, something that caused my entire team to mess up our placements. I like the idea of this map, but I would prefer it on a smaller scale. Review by brokehiselbows on 11/23/2012. Review by EASI on 3/21/2012. 8 out of 16 people found this review helpful. Review by Maximillian I on 3/21/2012. Well designed map, the sheer number of bonuses are a bit frightening for the casual gamers like myself. Review by ngduyhieu on 6/15/2012. Review by General Zukov on 6/19/2012. Review by gui on 1/21/2013. Great map! In the beginning the bonus seemed to me as to be hard to achieve. But to attack the enemy early helps to destroy his bonus. Review by Vincenzo Di Maida on 4/26/2013. Review by Vector on 3/6/2013. Review by Lord Raimonds of Baltic on 9/30/2013. Review by otinanaimail on 6/10/2014. Review by INSIDE on 9/9/2013. Review by cor696 on 12/17/2012. Review by Lord Blackdeath on 8/30/2014. So... A very detailed and well-thought map of Europe, the one who built it must have spendt a crazy amount of time designing it. Unfortunately, its main advantage is also its main trouble : getting into it is really complex as bonuses overlap and are not (at all) clear. Woulkd be great on a multi-day game I guess. It also has an imbalance problem between East and West and, to a lesser extend, center and perifery. Review by Lorkantzon on 5/26/2017. Review by StarKiller on 3/26/2012. Review by Ccclavin on 5/29/2012. How can one person have 400 armies 10 moves in? Review by ChrisCMU on 7/18/2012. Fun map. Although it seems like there is only one good area to start in. Review by ? on 4/27/2012. Review by Old Toby on 4/29/2012. I dont like this map. 3 out of 11 people found this review helpful. Review by curie77 on 9/16/2012. Review by Farkeld on 6/20/2012.